Have you heard that saying that declares that diamonds are a girl’s best friend? I’ve been trying Lionesse’s Diamond De-Puffer for some weeks now, and I must tell you, I don’t know if they are a girl’s best friend, but surely, they’re your skin’s best ally. The last couple of months I’ve been feeling rather tired and with a lot of stress. Everybody knows that stress affects everything from your health to your job. At night, I couldn’t sleep, so every morning, I woke up feeling even more tired than the day before. Obviously, this began to have physical repercussions. My skin was starting to acquire a dull aspect. I looked older, because fine lines and wrinkles began to make an appearance, and the long insomnia nights gave me not only dark circles, but puffiness, too. One day, a coworker was so alarmed at my appearance, that she insisted in giving me her beauty secret weapon: The Diamond De-Puffer from Lionesse. I was in shock! I didn’t know that there were skin care products made of crystals and gemstones! And which gems? Diamonds! For many days, I didn’t dare to use the Diamond De-Puffer. I mean, I knew that I needed it more than ever, but I didn’t want to finish it. LOL! For several days I dedicated to read all about gemstone skin care. Although I’ve never heard of it, gems have been used for makeup and beauty treatments since ancient times. For thousands of years, people have been using crystals and gemstones for beauty and healing purposes. The Egyptians used pulverized malachite and lapis lazuli for eye makeup. They thought that green and blue colors protected those who wore it from evil. Chinese medicine incorporated healing crystals and gemstones like jade to their acupuncture practices, and it was a venerated stone between royalty. In Greece, onyx was used for protection against adversaries in war conflicts. Curiously enough, diamonds have been around long time ago, but not as healing crystals or even jewelry. For their hardness, they were used as tools! The first record that we have of the use of diamonds as jewelry or embezzlement is in Ancient India, where they use diamond rings as symbol of status, and placed them in the eyes of their deities. Finally, one morning I woke up with such puffy eyes, that I myself got scared when I saw my face in the mirror. In that precise moment, I understood that it was time to do something. I took the beautiful box in which the Diamond De-Puffer was perfectly placed and opened it. I was mesmerized with the beauty of the whole package. The box itself was very soft to the touch and had silver glitter. It opens in the most unusual way, making it easy to have access to the product. The bottle is of a bright silver color, lightweight, and very beautiful. I opened it very carefully and pumped some cream on my ring finger. Very gently, I applied the cream to my under eye area, and tapped it until my skin absorbed it completely. I decided that I would rest my eyes for a while, so I just lied on my bed, hoping for the Diamond De-Puffer to really work its magic. What a wonderful surprise it was to get up a couple of hours later and see that the cream really worked! My puffy eyes were no more!!! It was amazing! The Diamond De-Puffer really took some years from my face! I looked rested, and the skin around my eyes not only seemed firmer, it also felt tighter. It was a miracle! So, if you’re really struggling with eye puffiness, I really, really, really recommend you use Lionesse’s Diamond De-Puffer. Not only will you feel like royalty applying an eye cream made of one of the most luxurious jewels in the world, but you will actually be doing some good to your skin and your appearance. After that amazing recovery, I thought that I should make some changes if I really wanted to improve my skin’s appearance. I told you before that it wasn’t only puffy eyes; I was really struggling with fine lines and wrinkles, too. I’m telling you, these last months have really made an impact in the look and feel of my skin. 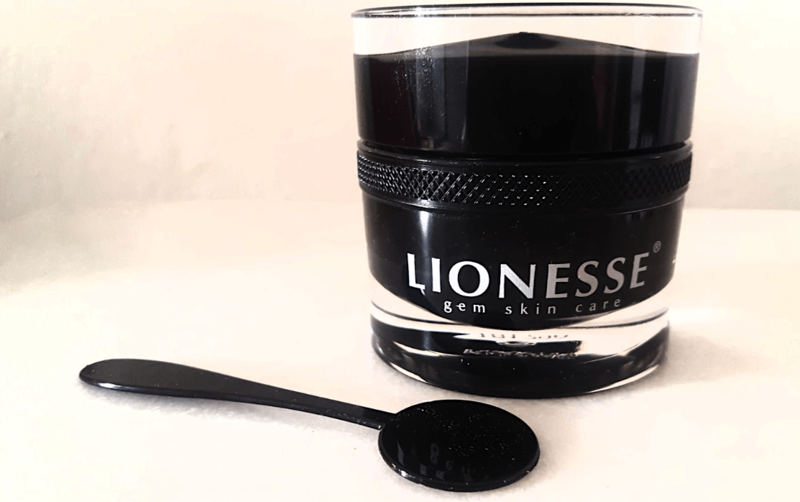 So, I decided to make some research, and I found out that Lionesse have an incredible collection of skin care products made of different gemstones! They have products formulated with sapphires, onyx, opals, and even pearls! My skin really needed some pampering, but more than that, it needed products that rejuvenate its appearance effectively. 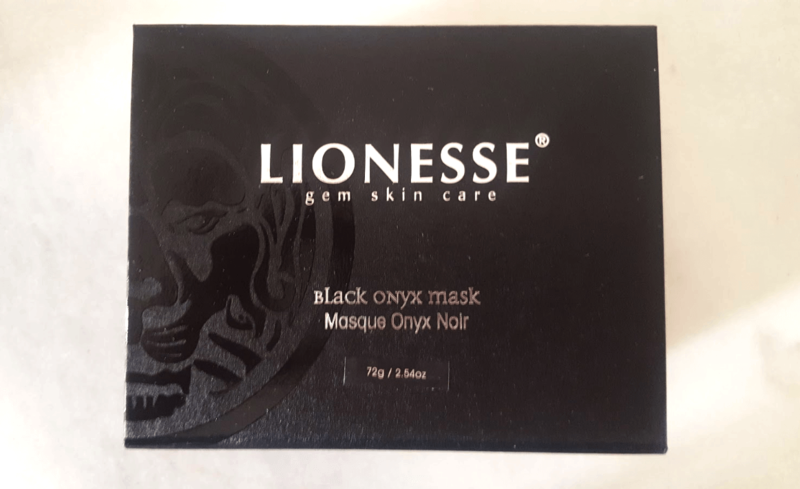 It was very hard to choose among all those amazing products, but I finally went with the Black Onyx Mask. The description in the website says that this mask produces an instant warming effect that helps your skin to get rid of makeup, dirt, and oils. Besides having black onyx powder, it is infused with sweet almond oil, which gives your skin a velvety soft feeling. 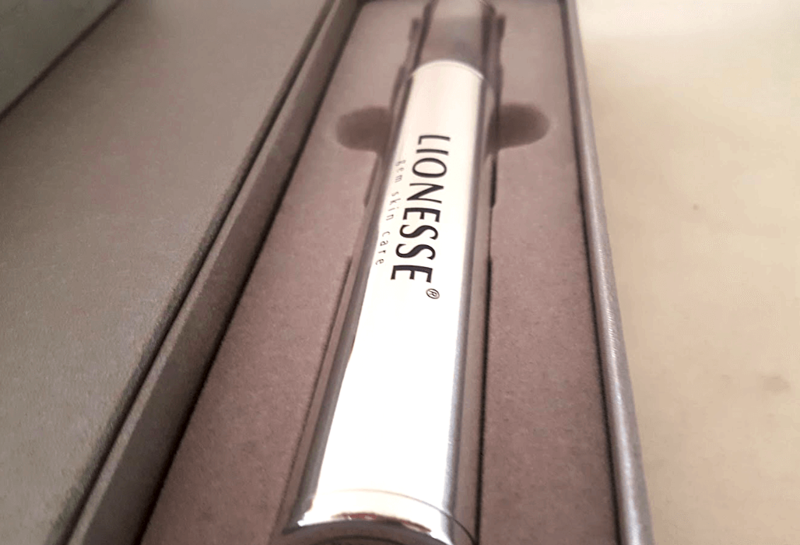 I must tell you that using Lionesse’s products is a luxurious experience from the beginning to the end. The packaging is so beautiful! Is like the promise that your face will look and feel as soft and luminous as the boxes after you use their products. Inside this beautiful, elegant, and sleek black box, you will find a perfectly placed luxurious bottle containing the Black Onyx Mask. I’ve been using masks since my teen years, so I considered myself an expert in this area, but Lionesse’s masks made me discover some shameful truths, like that I knew nothing about how to apply a mask. I always used my fingers to apply face masks, but when un-boxing the Black Onyx Mask, I noticed that it came with a spoon. The spoon, of course, is for applying the mask without having to use your fingers, which can introduce bacteria, germs, and other contaminating agents to your face and to the mask as well. It also adds a sense of luxury and lavishness, maximizing your masking experience. The Black Onyx Mask smooths really nicely over the skin and has an instant warming effect. This helps detoxing and purifying your skin, while it draws out all the dirt and dead cells. As I applied it, I could feel it already doing its magic. I waited 15 minutes, just as the instructions indicate, and then I rinsed it with fresh water. My skin definitely felt very soft and velvety smooth, and it looked brighter! The whole experience was incredible, and I can confirm that this mask safe my face! I’ve been using it since, and it has softened the appearance of wrinkles and fine lines. I look younger and healthier than ever, and my face achieved a very luminous glow. It’s amazing how beauty products can have such an impact in one’s life. Since I’ve been using Lionesse’s products, I’ve been feeling so much better! Of course, it isn’t just the products, but they are a great help. Many beauty products are packed with nourishing ingredients and soothing antioxidants that help you look better by enhancing your skin’s natural glow. This helps boost your confidence and self-esteem. Just by using the Diamond De-Puffer regularly, watch my puffiness disappear, and noticing how rested and refreshed I looked has help me sleep better. Really! I’ve been sleeping at least 8 hours every night! The Black Onyx Mask has made my complexion’s appearance brighter and younger, which have made me feel incredibly happy and thankful. After feeling more confident and positive, I started eating better and working out. I won’t lie, I still indulge occasionally with a delicious pepperoni pizza or a hamburger, but I eat vegetables and fruit on a daily basis. I quit smoking, too, and I go to the gym 3 times a week at least, and sometimes even 4 times. I started practicing yoga and Pilates, and when I feel a bit more adventurous, I do Zumba, too! What I’m trying to say is that, many times, we tend to underestimate the power of skin care and beauty products, believing that taking good care of oneself is a shallow and frivolous activity. Nothing farther from the truth. Pampering and indulging ourselves must be of top importance to preserve our good health, mentally and physically. Feeling so good has inspired me to help other people to feel better, to be happier. I entered a volunteer program to engage and reconnect with my community. I also started considering making a career change and start studying something quite different to what I have been doing for years. And all of this thanks to two amazing and wonderful skin care products! For all of those who feel tired, desperate, and disappointed I tell you, there’s hope. This isn’t as good as it gets, it really gets better. I will share with you my daily routine for feeling better. This way, you can start making some changes little by little. You don’t have to incorporate all these things right away. You don’t have to follow this list exactly either (except maybe for the skin care routine, which I wholeheartedly recommend). Just do like I did. I started with just two things, a facial mask and a de-puffer cream. That’s it. But it was enough to start filling up the gaps I felt I had in my life. As you start to feel more energized and more positive, you can begin to make some changes that will have great impact (a positive one) in your life. It’s just a matter of wanting it and making it happen. Trust me, the rewards are endless. You start with beautiful, healthy glowing skin, and finish feeling and becoming a beautiful and complete human being. This entry was posted in Reviews and tagged Lionesse, Lionesse Gem, product review, puffy eyes. This sounds amazing and perfect for me! Thanks for your insight! It was interesting to learn that you should apply a mask with some sort of applicator. It never occured to me that using my fingers could transfer bacteria into the mask and my skin. Lionesse obviously puts a lot of thought into their products which sound amazing. The Lionesse Diamond De-Puffer sounds like it is very beneficial to women’s puffy eyes. It works on getting rid of the puffiness in one’s eyes. It also, makes the skin around the firmer while making the entire face look brighter and rested. The Black Onyx Mask helps with detoxing and purifying one’s face. This makes one feel rich, pampered, and thankful due to the expertise of the product. I’d enjoy trying out these products. This sounds absolutely amazing. I was born with tired looking eyes so aging is definitely not doing my eyes any favors. I am really interested in trying this product. 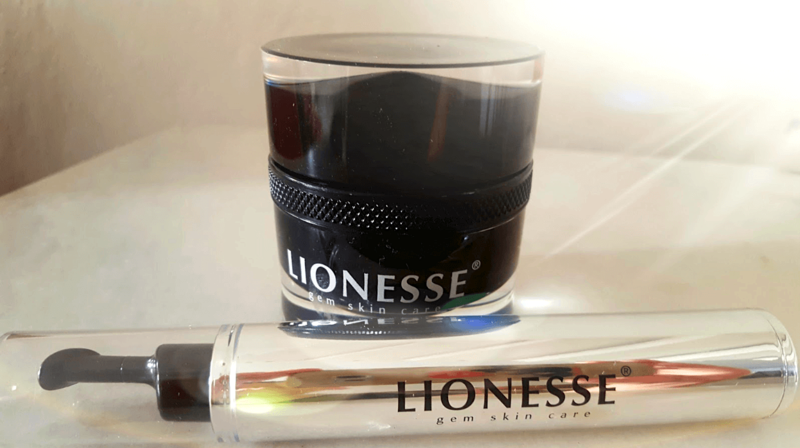 I’m using a Lionesse eye cream and love it. I need to try the De-puffer. What a great sounding product. Can’t wait to try any of these! This mask sounds amazing!!! I hope I win the raffle!! Good luck all!! would love to try! Awesome products! Wow – if it works, it would do wonders for me! Wow! This an amazing giveway! I would love to experience this product! I like your routine. My wife would love Lionesse Beauty products. Can’t wait to try this product. Looks amazing! Oh looks so fabulous!Definitely something I would love to try! I like Lionesse’s Diamond De-Puffer. This looks amazing, I definitely need to give it a try. These skin care products look very nice. Thanks for sharing!